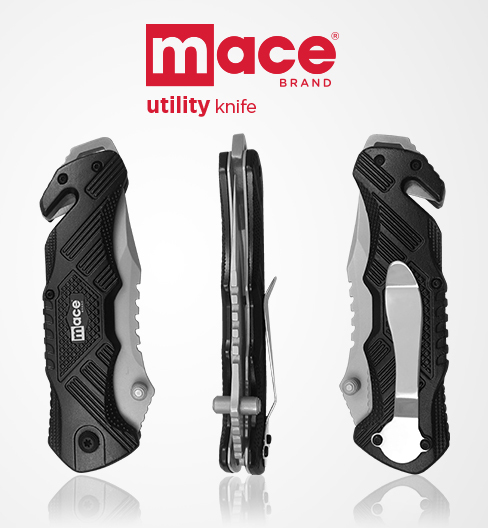 Introducing the new Mace® Brand Utility Knives, 440C stainless steel blade and aircraft grade aluminum handle. Includes seatbelt cutting tool, window break tip and a durable belt/pocket clip. CLEVELAND (August 1, 2017) – Mace® Security International, Inc. today announced the launch of a multiuse utility knife. This is the first knife produced by Mace Brand, and will further diversify their complete range of personal safety and security products. Globally, auto accidents are the ninth leading cause of death and in the United States alone, over 2 million will suffer severe injury or disability due to car crashes each year. The Mace Brand Utility Knife features a combination serrated and straight sharp blade along with seat belt cutting and window breaking tools on the handle. The one hand open capability could be a crucial asset to getting oneself or others out of a dangerous situation if involved in a car accident. The Mace Brand Utility Knife is priced at $24.99 and comes with a one year warranty. Consumers looking to purchase the knife can visit Amazon, Vigilant, Mace, Discount Drug Mart and other fine retailers across the USA. Mace Security International, Inc. is a globally recognized leader in personal safety and security. Based in Cleveland, Ohio, the company has spent more than 40 years designing and manufacturing consumer and tactical products for personal defense, security and surveillance under its world-renowned Mace® Brand—the original trusted brand of defense spray products. The company also offers aerosol defense sprays and tactical products for law enforcement and security professionals worldwide through its Mace® Take Down® brand. CLEVELAND – August 10, 2017 – Mace Security International Inc. (OTCQX: MACE) today announced unaudited financial results for the second quarter and six-month period ended June 30, 2017. McCann noted that the company will continue to work on new products, promotions and distribution opportunities in the back half of 2017. August 11, on Mace’s website under Investor Relations, Shareholder Transcripts & Presentations. A digital recording of the teleconference will be available on the Mace website within 24 hours of the teleconference. Mace Security International Inc. is a globally recognized leader in personal safety and security. Based in Cleveland, Ohio, the company has spent more than 40 years designing and manufacturing consumer and tactical products for personal defense, security and surveillance under its world-renowned Mace® Brand – the original trusted brand of pepper spray products. The company also offers aerosol defense sprays and tactical products for law enforcement and security professionals worldwide through its Mace® and Take Down® brands.